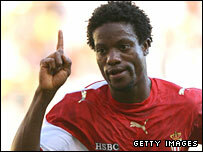 Sierra Leone captain Mohamed Kallon has signed a six-month contract with the leaders of the Greek league AEK Athens. The 28-year-old striker has been told his time with the club could be extended if he impresses. "I'm pleased to have joined AEK Athens and I hope to do my best and bring more success to the team," Kallon said. "The club is one of the biggest in Greece and they're doing well in the Uefa Cup, I know I've made a good decision," Kallon added. The former Inter Milan marksman had been without club for almost four months after terminating his contract with French side Monaco by mutual consent. He scored eleven league goals for Monaco during the 2004/05 season but fell out of favour and joined Saudi Arabia's Al-Ittihad on loan in 2005/06. Kallon spent two more seasons with Monaco on his return but only played eight more times in Ligue 1. This is the twelfth club Kallon has played at during his career having previously spent time with sides in Sierra Leone, Lebanon, Sweden, Switzerland, Italy, Saudi Arabia and France respectively.